Some action sports enthusiast, spend a lot of their lives on skateboards. The Heroic Adventures team has collectively skated all over the world; it’s been a privilege to experience exotic urban landscapes while skating on multiple continents. What we’ve learned is this — not all places are created equal, especially when you are traveling as a skateboarder. The peaceful small city of Varna, Bulgaria? Scenic, indeed, but its cobblestone roads are not going to be very friendly to urethane wheels. With some of these past experiences in mind, we’ve compiled a list of the 4 best cities in the world to ride a skateboard. OK, so this is an obvious one, but there was no way we could overlook it for this article. After all, LA really does have everything, and it is especially perfect for those into board sports — surfing, skating, and even snowboarding (within a few hours). Its legendary Venice Beach, it’s skate park featured in the photo at the top of this article, was the birthplace of the Z-boys, and it has been at the center of the skate industry for years. 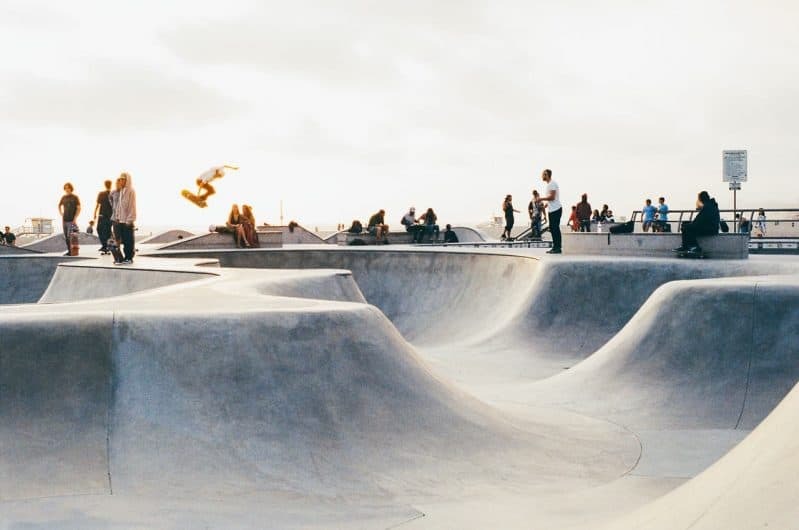 Currently, mainstream events such as the X-Games, Street League, and Dew Tour all make regular stops through LA, and it is home to some of the world’s most famous street spots and skate parks. An additional factor that makes LA such a great place for action sports lovers is that it has perfect weather year round, with an average temperature of 70 degrees. Downtown LA, skating on some of Frank Gehry’s iconic architecture — the Walt Disney Concert Hall. In the early 2000s, Barcelona became a sort of mythical skate mecca for skateboarders. Tired of contending with skatestoppers and overzealous security guards in California and other parts of the US, pros and amateurs alike began skipping across the pond to session the amazing and virtually untapped terrain of Barcelona. With nary a skatestopper in sight and a populace that hadn’t yet learned to dislike skateboarding and the property damage it unfortunately causes, it became a veritable skate playground until the latter half of the 2000s. These days, Barcelona isn’t quite the skate mecca that it once was, but it still offers a bunch of amazing and still somewhat untapped terrain for the intrepid traveler. Shenzhen, China might just be the best place in the world to skate that you have never heard of. With amazing marble terrain and lax security, Shenzhen emerged in the late 2000s as a place where you could fly to at the 11th hour to film a video part and walk away with several minutes of gold footage. While Shenzhen is firmly located in communist China, the reality is that the police there have bigger problems to contend with than skateboarding, and most of them have never even seen a skateboard in the first place. Also, it’s easy to get to: it’s just an hour away from downtown Hong Kong. This, combined with an abundance of marble ledges and unconventional architecture, contributes to make Shenzhen one of the best cities in the world to skate in. If you’re traveling to Shenzhen, get the guidebook that will be your companion throughout the city as you conquer the town on your skateboard, get a free chapter of the ultimate guide to Shenzhen here. Another Chinese city on the list? The reality is that China is “the place to be” for a wide swath of industries in 2014, and skateboarding is no exception. Like Shenzhen, Shanghai is full of perfect marble ledges that require no wax at all to slide. However, it makes our list not because of its marble-y perfection, but because of the uniqueness of some of its skatespots. You see, while many skatespots in Shanghai are perfect, not all of them are, and skating here is a bit like being dropped in the middle of a Static vide. If you are comfortable adapting to new, quirky terrain and like the harsh east coast vibe (and east coast winter) that Shanghai is known for, this is your city. It also earns bonus points for the lifestyle. While Shenzhen and Guangzhou might have the highest percentage of perfect skate spots in China (and probably the world), Shanghai has the highest percentage of bottle shops serving imported brews. And after a long heroic session, nothing is better than an ice, cold beer. Mmm, beer. Whether you want to grind some curbs, or just roll around, skateboards are easy to pack and fun transport to expand your adventures when traveling.